Welcome back to this week’s real food blog carnival. This is where you share your recipes so we can all benefit. Here are some great looking recipes shared last week. Thanks so much for highlighting my hummus! I'm loving the idea of Strawberry Ginger Rhubarb Crisp from Hecka-Good-Recipes. It just screams summer! Can't wait to see what's linked up today. Who could argue with Sangria. Wish I had some right now. 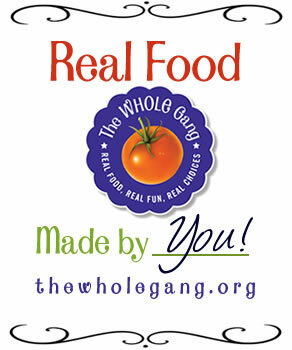 Thank you for hosting Real Food Weekly. I'm looking forward to visiting all the great links today! Mindy thank you for joining the party! Diane, thanks for hosting and for highlighting my Strawberry Ginger Rhubarb Crisp! This week I am sharing my recipe for a dairy, gluten and egg free Dark Chocolate Pudding. I have made it twice since last week and it always disappears within minutes! What a great blog carnival. I'm so glad you're doing this. I look forward to checking this out weekly. Thanks!